The role of retinal direction-selective ganglion cells for the transmission of visual signals. During the past years, one important target of research have been the direction selective ganglion cells (DSGCs) which were the first identified cell type able to perform differential response depending on the motion direction. However it appeared more recently that direction-selective processes result from the integration by the DSGCs of numerous inputs, which could be themselves direction-selective. Several asymmetric pathways are set up during the development of the retina, creating axis sensitivity to motion in a particular direction, and facilitate the firing in this direction. In this review, I will focus on the cellular mechanisms leading to this specific sensitivity and thus to direction selectivity in the mammalian retina. 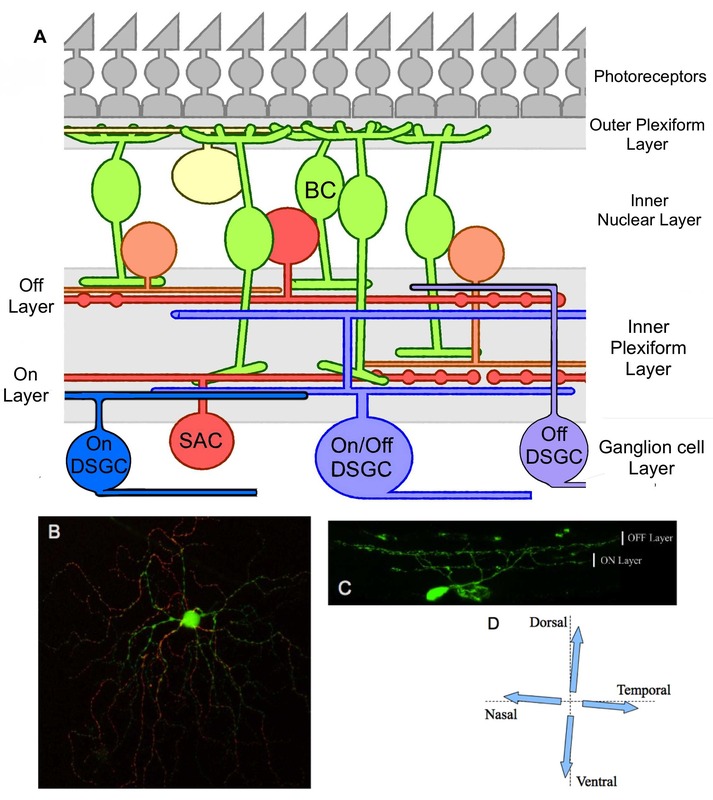 In the vertebrate retina, the direction-selective ganglion cells are neurons located in the ganglion cell layer, and are involved in motion detection. The DSGCs are characterized by a strong firing activity if a visual stimulus moves according to the “preferred” direction of the cell, in contrast a visual stimulus induces very few action potentials when moving according the opposite “null” direction [1,2] Since the discovery of the phenomena by Barlow and Lewick, most of the studies were made on the rabbit retina, nonetheless several data showed that DSGCs also exist in mouse [3–5]. When light reaches the retina and activates the photoreceptors, the stimulation is then transferred to bipolar cells and amacrine cells, which propagate the signal in the inner layers of the retina. In the inner plexiform layer, the DSGCs establish many synaptic contacts with intermediate cells (Figure 1A): the starburst amacrine cells (SAC) and the bipolar cells (BC) thus compute numerous inputs from their neighboring cells before delivering the integrated signals to superior cognitive centers. The ensemble of these photoreceptors and intermediate cells which can lead to the firing of one single DSGC when stimulated by a lightening spot are defined as the receptive field of this DSGC. In the present article we try to understand some of the cellular processes related to direction selectivity which occur at the level of DSGCs. Figure 1. Global organization of DSGCs in the retina. Global organization of DSGCs in the retina. A. Structural schema of the retina which emphasize the connections between the DSGCs and other retinal cells in the IPL. BC, bipolar cell; SAC, starburst amacrine cell. B. Photography of the dendritic architecture of a putative ON/OFF DSGC expressing GFP. The ON (green) and OFF (red) parts of the dendritic field were obtained from several stacks projections. C. Vertical section of a putative ON/OFF DSGC expressing GFP; dendrites stratify in both ON and OFF sub-laminae of the inner plexiform layer. D. Representation of the four possible preferred directions in an ON/OFF DSGC. Depending on the light sensitivity of the DSGCs, both an increase or a decrease in light intensity can induce cellular response, allowing the distinction between ON and OFF cell types respectively . Based on these variations regarding light sensibility, three different subtypes of DSGC have been identified: ON/OFF, ON and OFF. The ON/OFF DSGCs can perform two types of responses, they are sensitive to both dark-light and light-dark transition in their receptor field. They are characterized by a bi-stratified dendritic arborisation, localized in the ON and OFF layer of the inner plexiform layer (Figure 1B and 1C). Furthermore several evidence show a capacity to respond to a large scale of velocities . For these reasons ON/OFF DSGCs were suspected to be the main motion detector in the retina. In addition the ON/OFF DSGCs can be separated into four subtypes that correspond to the four possible axis for preferred directions: ventral, dorsal, nasal or temporal (Figure 1D and reference . Some recent studies showed that several genes could label ON/OFF DSGC according to their preferred direction, using modified mice strains expressing fluorescent proteins and immuno-detection. One of the first studies, in which the authors labelled specifically the nasal subtype, was obtained in mice with the GFP placed under the control of the dopamine receptor D4 promotor . More recently, it has been proved that the cocaine and amphetamine regulated transcript (CART) allow the distinction of ON/OFF DSGC from other retinal ganglion cells, and that ON/OFF DSGCs preferring a vertical motion express Cadherin 6 (Cdh6) and CollagenXXVα1(Col25a1) ••. These labeling possibilities (for a summary see Table 1.) were used to determine the targets of DSGCs in visual area (see below: Projections of DSGCs on visual centers). Similarly these genetic tools should help revealing intrinsic specificities and functions for the several subtypes of DSGCs. Table 1. Summary of the markers and transgenic mouse lines for the specific labeling of DSGC subtypes. Summary of the markers and transgenic mouse lines for the specific labeling of DSGC subtypes. The second type of DS cells is called the ON DSGC which stratifies in the ON layer of the IPL (Figure 1A). They respond exclusively to a dark-light transition and exhibit high sensitivity to motion direction. In the mouse retina, synaptic recording revealed some similarities with ON/OFF DSGC. Indeed higher excitatory conductances can be observed along preferred direction and in the opposite direction, higher inhibitory conductances are found . But contrary to the ON/OFF type, they only show three possible preferred directions: dorsal, ventral or temporal (Figure 2D) and are sensitive only to low and moderate motion speed [6,7]. The study of ON DSGCs responses depending on the velocity of the image reveals that ON DSGCs are inhibited by high speed motion and this mechanism is mediated by a reduction of excitatory inputs and an increase in inhibitory inputs . Recent data show that ON DSGCs can be separated in two subtypes, depending on their morphology and electrical response to a light stimulus •. The predominant type, sustained ON DSGC give more intensive and longer responses after stimulation with a moving lightning bar than transient ON DSGC (Figure 2B). 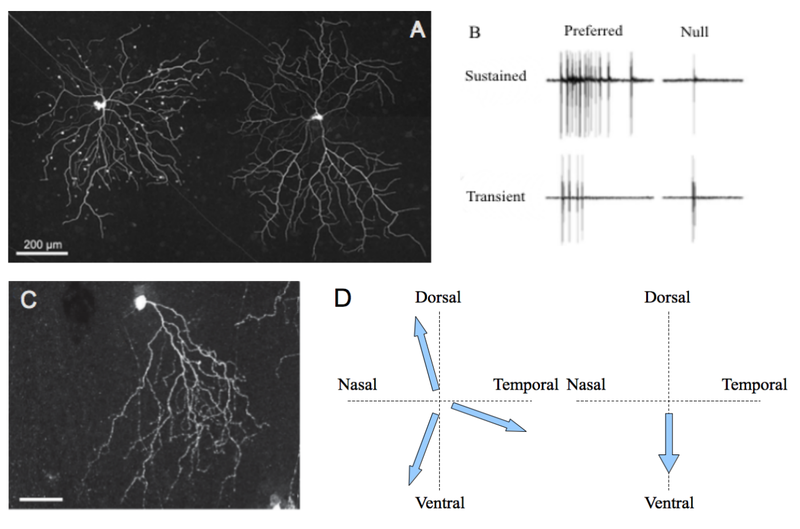 Both of them stratify in the ON layer of the retina , but neurobiotin staining revealed that sustained cells present also an increase of short dendritic ramifications, and do not present any connections with amacrine cells (Figure 2A), contrary to transient cells with numerous amacrine connections, and higher length for terminal dendrites . Recently a new type of retinal ganglion cell has been identified in transgenic mice with YFP expression under Junction Adhesion Molecule B (JAM-B+) promotor. JAM-B+ GCs respond to a light-dark transition combined with an upward motion ••, which is characteristic of an OFF DS response. These properties appear to rely on the asymmetry of the dendritic field that points ventrally (Figure 2C). Indeed direction selectivity is lost in JAM-B+ cells with a symmetric dendritic field but the OFF response is conserved. These properties suggest the existence of a new DS-mechanism diverging from ON/OFF or ON DSGCs, in which direction selectivity appears to be dependent of the shape of the dendritic field [14,15]. However very few data are currently available concerning this subtype of DSGC, and the synaptic processes remains globally unclear. Figure 2. Characteristics of ON and OFF DSGC subtypes. Characteristics of ON and OFF DSGC subtypes. A. Transient (left) and sustained (right) ON DSGCs after neurobiotin injection. White dots represent connected amacrine cells. B. Electrophysiological recordings of the differential responses of sustained and transient DSGCs for a stimulus moving along preferred/null axis. Both A and B panel are from . C. Morphology of an OFF DSGC. The asymmetric dendritic tree points towards the ventral direction of the retina (scale bar: 50μm). This repartition probably explains the sensibility of the cell for motion following the direction soma-dendrites. The photography was taken from the referred article ••. D. Comparison of the preferred axis for ON (left) and OFF (right) DSGC subtypes. It has been reported that the destruction of the SAC network surrounding a DSGC induces a complete loss of direction selectivity , and thus showed that SACs are major components for the DS processes. Indeed, the SACs establish a large quantity of synaptic interaction with the DSGCs, and modulate inputs signals coming from photoreceptors and transferred by bipolar cells . Furthermore these cells possess two types of neurotransmitter: GABA and acetylcholine (Ach) , allowing them to perform both excitation and inhibition on their downstream targets. Because GABA receptor inhibition on DSGCs leads to a loss of direction selectivity in ON/OFF DSGC , GABA pathways have been suspected to play a central role in the establishment of DS mechanisms. Recent studies on the asymmetric repartition of SACs onto the dendritic tree of DSGC also indicate that the repartition of GABA and cholinergic synapses could provide direction selective inputs. On the dendritic field of a DS cell, a stimulus moving along the “null” direction will elicit an extremely low firing activity, thus it is possible to define the “null” side of this cell as the first part of the dendritic field that receives the light coming from a visual stimulus moving along the “null” direction. On the “null” side of the DSGC dendritic field, several evidence show that the number of inhibitory GABAergic contacts is increased ••. Similarly, another study  underlines the reduced direction selectivity when inhibition of GABA receptors are performed, lowering the amount of functional GABA synapses and thus reducing the asymmetric inhibition of the DSGC. Moreover similar cholinergic conductances were observed on both sides of the preferred/null axis, and thus suggests an equal repartition of cholinergic synapses  This asymmetric organization in the repartition of synapses facilitates the formation of action potentials along the preferred direction where inhibitory inputs from GABA synapses are reduced, and therefore enhances the efficiency of cholinergic and glutamatergic excitatory synapses ••. On the null side where more inhibitory synapses are present, higher GABA secretion reduces the impact of cholinergic and glutamatergic inputs and thus reduces firing along null direction (Figure 3B). Figure 3. A model for direction selectivity depending on presynaptic pattern. A model for direction selectivity depending on presynaptic pattern. A. Repartition of cholinergic and GABAergic synapses on the preferred/null axis. This figure illustrates the inhibition of excitatory synapses caused by a motion along null direction. The figure is available in Lee S. et al (2010) in its original form. B. Details of the possible interactions between inhibitory and excitatory synapses on a DSGC. On the preferred side both cholinergic and glutamatergic releases induce postsynaptic activation because the reduced GABA inhibition facilitates firing. A movement in the null direction provokes the release of excitatory but mainly inhibitory neurotransmitters from the same SAC, which causes a local inhibition of the DSGC. This relationship with SACs also prevents firing of the DSGC on the null side under glutamatergic inputs from bipolar cells. Each pathway, glutamatergic, cholinergic and GABAergic, is represented by a unique color green, red and blue, respectively. Facing the increasing importance of SACs for the patterning of direction selectivity, it was proposed that SACs themselves were direction selective. In the following paragraph I provide some examples of asymmetric organization in SACs which could be the basics of these DS properties. Some recent results show that the effects of neurotransmitters on SACs could depend on the asymmetric repartition of ions in the dendrites •••. It appears in SACs that the calcium signal which provides inhibition through GABA release is more intensive to the dendritic tips than near the soma, demonstrating that the output in SACs is itself direction selective •. It was also observed that GABA induces a hyperpolarization at the dendritic tips, but has a depolarizing effect near the soma of SAC ••. The authors suggested a model where a gradient of Cl- modify deeply the ionic potential at the membrane and so changes the direction of ionic currents when GABA binds to his receptor. As a results GABA causes a hyperpolarization at the dendritic tips with an outward flux of Cl- (caused by a high Cl- concentration), but near the soma it appears to produce the opposite effect ••. This polarisation of the SACs was suspected to be the origin of these intrinsic DS properties. In ON DSGCs, GABA inhibition leads to the apparition of an OFF direction selective response , in other words the cells become sensitive to the transition from a light to a dark context, where in ON/OFF type it creates a loss of direction selectivity . These different behaviors facing an inhibition of GABA receptors suggest that the mechanism creating direction selectivity is different between ON and ON/OFF subtypes. However we have to acknowledge that in both subtypes the GABA secretion induces an inhibition of other excitatory conductances. In this context of GABA inhibition, it is interesting that cholinergic antagonists provoke a loss of direction selectivity for this “new” OFF response . We can assume that cholinergic pathways create direction selective output onto ON DSGCs, however their real importance in the natural ON response remains poorly understood. Indeed the major parts of data concerning cholinergic signaling are related to ON/OFF DSGCs, the use of cholinergic inhibitors reduces the response (for both ON and OFF components) for a majority of cells but do not change the preferred direction axis . This huge difference creates a major problem to make parallels between both subtypes and highlights the divergences among them. Because of the increasing importance of SACs in DS processes, DSGCs have recently be suspect to play very little role in direction selectivity because their properties could results from the input of asymmetric repartition of inhibitory and excitatory synapses of SACs. However recent results argue that DSGCs are still necessary for coding of direction selective output as it was suspected by Taylor and Vaney . These “endogenous” properties of DSGCs for direction selectivity apparently rely on the structure of the DSGCs. Targeting asymmetric ON/OFF DSGCs with dendrites oriented in the temporal direction (revealed by GFP under the control of Hb9 promotor), Trenholm showed that those cell conserve direction selective properties even in the presence of GABAergic and cholinergic inhibitors . It was assumed that the asymmetry of the dendritic field was responsible for such a behavior. This highlights the results concerning the OFF DSGCs, whose preferred direction corresponds to the orientation of the asymmetric dendritic tips ••. This hypothesis is also supported by a model developed recently which reveals that the inhibition at dendritic tips prevent locally the firing but is not sufficient to suppress the propagation of initiated spikes ••. Thus the DSGC dendritic tree has to be partitioned in separate regions, one which locally sums excitatory and inhibitory inputs generating spikes above a defined threshold of excitation, and another part which propagates these existing spikes to the soma thanks to Na- channels ••. In this model the first part of the dendritic tree is responsible of the emergence of direction selective response, the second part allow the appropriate conditions for the signal propagation. It also suggests the partial overlapping of these intrinsic DS properties of a DSGC with presynaptic inputs to create a more reliable DS mechanism ••. Such results lead to the conclusion that even in symmetric ON/OFF DSGC the shape of the dendritic tree could still play a role for the determination of the preferred direction and therefore suggest the existence of an unknown post- synaptic mechanism related to the architecture of the dendrites in DSGC and the position of ionic channels. 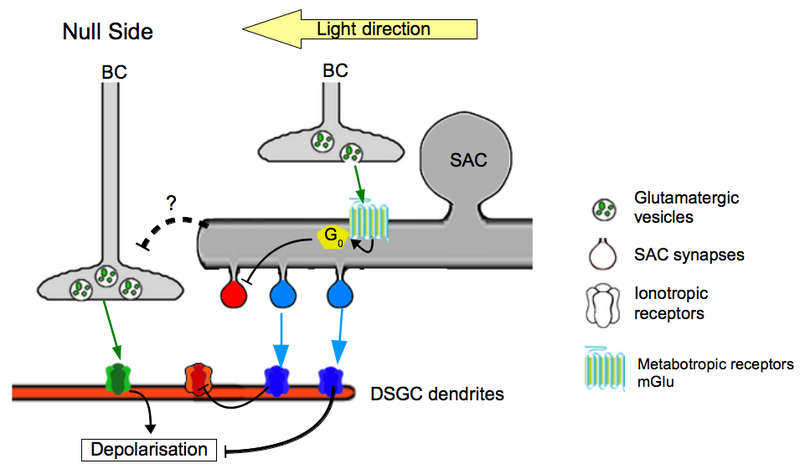 The signals from the cone photoreceptors are transferred to DSGCs via the bipolar cells, which establish excitatory glutamatergic synapses with the DSGCs . Several evidences demonstrated that a certain type of labelled bipolar cell co-stratify with ON starburst amacrine cells and with the ON part of DSGC dendritic arbors , which indicates that a this type of BC could provide selective output to the ON layer of the inner plexiform layer. This may be the basis of a specific excitatory process related to direction selectivity through a specific wiring of the DSGCs. Among the several types of glutamate receptors, several studies found no evidence of an asymmetric repartition of AMPA , or kainate receptors  in both ON and OFF parts of DSGC dendritic arbors, suggesting that DS mechanisms driven by glutamate secretion depend strongly on presynaptic patterns. The suppression of the GABA response in DSGCs leads to an increase of the glutamate response on the null side . These findings illustrate that GABA is responsible on the null side of the inhibition of excitatory inputs created by glutamate and Ach. These data support the hypothesis that the patterns of glutamate secretion are not themselves direction-selective but rather that their apparent direction-selectivity is the consequence of the asymmetric inhibition created by the SACs. In this perspective GABA secretion would undermine the effect of glutamatergic pathways (Figure 4 by hyper-polarization of the postsynaptic compartment as it was suggested . Several clues suggest that bipolar cells participate to a lateral inhibition mechanism with the amacrine cells. The study of synapse clustering revealed the existence of a possible interaction which might lead finally to the inhibition of the DSGC . A model was proposed a few years later, after using several drugs inhibiting the second group of metabotropic glutamate receptors, located only on amacrine cells , Jensen  showed that these receptors participate to both establishment of direction selectivity in ON/OFF DSGC but also reduce the preferred direction response. Because those receptors are highly expressed in SACs, the author claimed that glutamatergic inputs from bipolar cells leads to the inhibition of Ach release in SACs  (Figure 4). This underlines the importance of an inhibiting pathway that could regulate the output of SACs on DSGCs, and thus modulate the amplitude of the response, particularly on the null side of the DSGC. The BCs could reduce the excitatory inputs on the null side through this lateral inhibition, whereas the BCs which fasciculate on DSGCs directly perform symmetric excitation on both preferred and null sides. This mechanism could enhance the asymmetric response of the preferred/null axis (Figure 4). Figure 4. Model of the different contributions of BCs to direction selectivity. Model of the different contributions of BCs to direction selectivity. The current data suggest the existence of two separated pathways : one directly exciting the DSGC and an indirect inhibiting the DSGC with a cooperation of SACs. Each color, green, red and blue is associated with glutamatergic, cholinergic and GABAergic pathways, respectively. If light experience appeared to be critical for the maintenance of a functional DS circuitry •, several studies suggest that the construction of the circuitry responsible for direction selectivity is independent of light stimulation •. Mice dark-rearing (from birth to 30 days) does not alter direction selectivity and recordings in the developing retina also show that non- mature DSGCs already possess direction selective light responses although those are lower and slower compared to mature DSGCs . Using mice lacking the ß2 subunit of the Ach receptor, several studies •• showed that developing DSGCs do not require cholinergic inputs for cell patterning establishment allowing direction selectivity in mature retina. Interestingly GABAergic inhibition in adult retina causes a complete loss of direction selectivity, the same blockade during the two first weeks after birth does not prevent direction selectivity establishment •.However these data confirm that GABAergic and cholinergic inputs are critical for the motion-detection mechanism but do not participate to its development. The retinal waves, a spontaneous and asymmetric electrical activity produced during the development are critical for the establishment of cellular pattern and the organization of the retina , and researchers thought they could produce the asymmetric pattern required for direction selectivity. But several results challenge the effect of this activity in the development of asymmetric inhibition and direction selectivity ••, which showed that the DS development is independent from electrical activity. These findings also reveal that the DS circuitry is in all likelihood formed according to a genetic mechanism, which remains unclear. The establishment of direction selectivity is supposed to rely on the modification of the inhibitory contacts in the SAC. During the development of ON DSGCs, the distribution of inhibitory synapses faces a transition from a symmetric to an asymmetric repartition between P6 and P9 . This asymmetric switch corresponds to an enhanced inhibitory connectivity at the null side and a weaker connectivity at the preferred side, whereas excitatory circuits remain mainly symmetric, and thus enforce the proposed model for the synaptic repartition and organization in SACs (Figure 3A) . Recently other finding showed that along the null side of nasal ON/OFF DSGCs, the GABAergic conductance from SACs are strengthened during the second week of postnatal development, but remain unchanged on the preferred side . However the authors noticed the number of synaptic contacts show moderate evolution during this phase of development, creating a symmetric pattern. This may suggest that the existing model of asymmetric inhibition relies more on the activity of the synapses than on their repartition as it was suggested. Nonetheless, an increase of inhibitory synaptic contacts was already established •• which could be enhanced in further steps of development. This hypothesis assumes also the necessity of a light experience, which could induce the reinforcement of synaptic contact according to this asymmetric strengthening of GABAergic synapses. The study of DSGC projections was developed quite recently using genetic labeling tools especially in mice and marker injections. One of the first study  which provided relative robust data in order to mark specifically a nasal ON/OFF DSGC also determines that the projections of those cells could be found only in the superior colliculus, and the lateral geniculate nucleus, structures that enhance the contrast between the signals sent by the different ganglion cells. This trend of DSGCs projecting to the superior colliculus and the lateral geniculate nucleus was then confirmed for the other subtypes of ON/OFF DSGCs, using transgenic mice allowing the specific labeling of these subtypes ••. The same study •• also revealed that only the projection of ON/OFF DSGCs preferring a vertical motion (labelled with CART and Cadherin6; see Table 1) were found in the medial terminate nucleus and the accessory optic system, which both participate to the elaboration of the optokinetic reflexes. These structures respond to global movement of the image and contribute to its stabilization on the retina . These findings support previous results concerning labelled ON DSGCs with a ventral preferred direction •. The projections of these cells were found only in the medial terminate nucleus but not in other integrative centers •. These two studies suggest that the medial terminate nucleus is a preferential site for the projections of ON and ON/OFF DSGCs with a preferred direction along the vertical axis. Interestingly, the axon projections for OFF DSGCs have already been established and point towards the superior colliculus and the dorsal lateral geniculate nucleus ••, but were not detected in other sites. This pattern is similar to the ON/OFF DSGC projections, and especially for those eliciting a horizontal movement. These results challenge the hypothesis of a projection towards the medial terminate nucleus for DSGC preferring vertical motion. According to the information provided in this review, it appears that direction-selective mechanisms rely on multi-scale processes. The asymmetric wiring of excitatory and inhibitory inputs establishes a robust preferred/null axis. Those inputs could themselves be modulated at a synaptic level. The computation of these signals is executed by the DSGC, and such a mechanism seems to depend on the dendritic organization and the repartition of ionic channels. Several new discoveries about the synaptic mechanisms also helped the researcher to determine the roles of the different cell types, and thus develop a more trustable and reliable model of direction selectivity. Despite such innovations, some points of these mechanisms remain unclear, mainly because of the high density of cellular connections and inputs on a single DSGC. In the past few years, one of the most important progresses in the study of DSGCs was the emergence of selective labeling for a reduced number of DSGC subtypes. We hope that these tools will provide us the means focus the research on the particularities and cellular functions which differentiate one from the others. I thank S. Haverkamp for reviewing this article and whose comments and advices helped to increase the quality of the present work. 7. Euler T, Hausselt SE: 1.19 - Direction-Selective Cells [Internet] . In The Senses: A Comprehensive Reference . Academic Press; 2008:413–422. ●● This study summarises the current existing methods to label DSGC subtypes and also reveal their clustering onto superior visual centers. ● With the following reference  this study shows evidence for the distinction between two ON DSGC subtypes in terms of morphologies and electrical responses to a light stimulus. ●● This is the first study which showed evidence for the existence of OFF DSGCs in the mammalian retina. 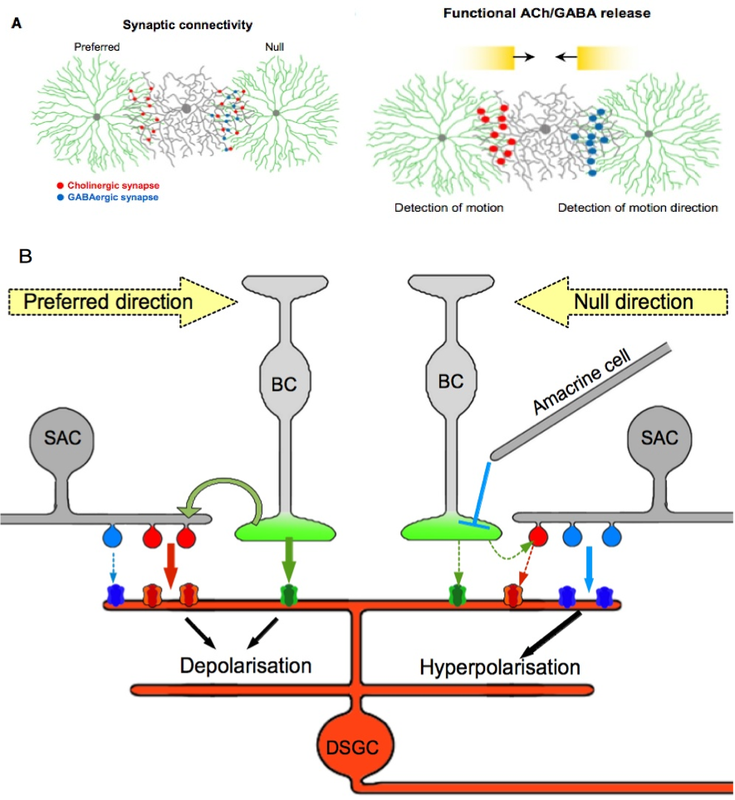 ●● This study highlights the asymmetric and strengthened connectivity of SACs with DSGCs on their null side, and also showed that SACs connect mainly with the distal part of their dendritic field. ●● This study provides a really interesting model for the interactions between excitatory and inhibitory synapses on DSGCs based on the asymmetric repartition of GABAergic synapses. ● This study provided evidence that the calcium signal is direction selective in the SAC itself, leading to a variable intensity of secretion along the dendrites of the SAC. ●● This study presents a model which could be the basics of an intrinsic direction selectivity in SACs. This is based on an asymmetric repartition of ions transporters which modulates the response of ionic channels and the secretory activity and creates differential response along the axis soma-dendrites. ●● These studies provided a model of DSGC postsynaptic potentials, which reveals the existence of different regions in the dendritic tree and explains their role in the creation of an intrinsic direction selective mechanism for DSGCs. ● This study presents evidence for a DS circuitry development which occurs independently from light experience and primary electrical activity in the retina. ● This study showed that direction selectivity development is independent from the main actors which create direction selectivity in the mature retina. ● This study provides clear clues for the projections of ventrally ON DSGCs in the visual centers using several techniques for cell labelling.